On February 5 just before 1 a.m., officers responded to Winterfield Place to reports of a subject walking the neighborhood and pulling on car door handles. 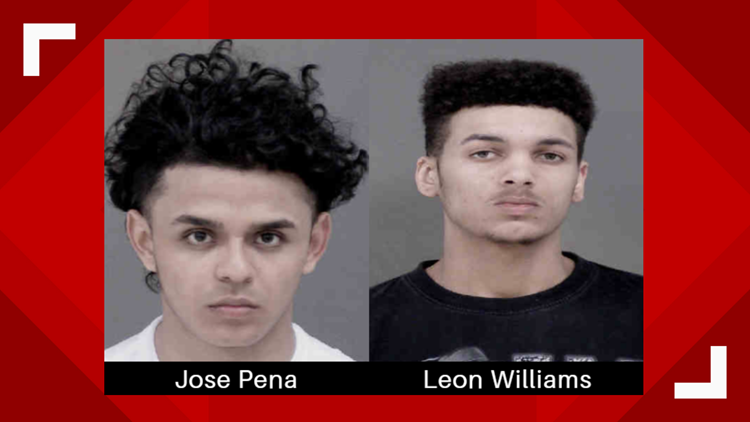 CHARLOTTE, N.C. — Three have been arrested after a series of vehicle break-ins, according to the Charlotte Mecklenburg Police Department. On February 5 just before 1 a.m., CMPD officers responded near the 3800 block of Winterfield Place to reports of a subject walking the neighborhood and pulling on car door handles. Officers located 20-year-old Jose Pena in possession of stolen items from four vehicles. Pena was interviewed and transported to custody of the Mecklenburg County Sheriff's Office for four counts of larceny from a motor vehicle and larceny. Later that day, just before 8:30 p.m., officers responded near the 3500 block of Connecticut Avenue to reports of three suspects breaking into a vehicle. While en route to the call, responding officers observed two people matching the description of the suspects. These two subjects were detained and identified as 19-year-old Leon Williams and a 14-year-old male juvenile. As a result of the investigation and interviews of both suspects, Williams was transported to custody of the Mecklenburg County Sheriff's Office and charged with breaking and entering a motor vehicle and criminal conspiracy. The juvenile was charged with breaking and entering a motor vehicle and criminal conspiracy. The 14-year-old suspect's mugshot was not released, as he is a minor.